Congrats to our WHL championship team! 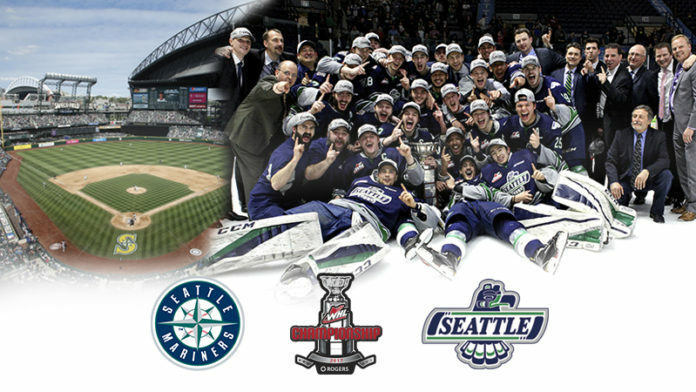 This Saturday, June 10, Seattle Thunderbirds head coach Steve Konowalchuk will throw out the ceremonial first pitch at the Seattle Mariners game against the Toronto Blue Jays at Safeco Field in Seattle. The game starts at 7:10 PM, and tickets can be purchased here by clicking on June 10 and selecting the desired seats, priced starting at $30 each. The Mariners are honoring the T-Birds for winning the 2017 WHL Championship. The T-Birds won the Western Hockey League Championship with a first round sweep of the Tri-City Americans, a second round sweep of the Everett Silvertips, a 4-2 series win over the Kelowna Rockets in the Western Conference Championship and a 4-2 series win over the Regina Pats in the WHL Championship. The T-Birds defeated the Regina Pats 4-3 in overtime of Game 6 to win the WHL Championship. Alexander True scored the game winning overtime goal. The Ed Chynoweth Cup and assistant coach Matt O’Dette will also be at the game and take part in the celebration of the T-Birds Championship season. Konowalchuk led the T-Birds to a 46-20-4-2 regular season record in 2016-17. In his six seasons as head coach, Konowalchuk has a 217-176-20-15 record.